Liquid body wash or shower gel is a relative newcomer to the spa/body care world. It’s an alternative to bar soap, which we’ve talked about before, and most people reach for a body wash because they’ve found bar soap to be too drying for their skin. But are conventional body washes actually more hydrating? Let’s talk about the ingredients that could be hiding in a body wash formula that might actually be doing you more harm than good. People tend to gravitate towards a body wash when they want something that feels more luxurious (read: slippery) and more moisturizing than bar soap. But some of those things we’re craving can actually contribute to drier, more irritated skin (especially in the winter). Often used as a “moisturizing” ingredient in body wash, petroleum (or petrolatum or mineral oil) is literally made from gas. It’s a semi-solid liquid that is considered emollient and conditioning. But, if you’ve ever used petroleum jelly on your lips, you’ll know that it doesn’t really penetrate your skin in a truly hydrating way. Instead, it sits atop your outer layer, blocking moisture from getting in. If you have sensitive skin, this can lead to irritation, on top of not actually getting the moisture you need. Sodium laureth sulfate is one of the more common surfactants, or foaming agents, found in conventional body wash. It’s used to create that luxurious lather we’ve been conditioned to crave—more suds means we’re getting cleaner, right? Not really. Instead, those foaming agents can be extra drying and irritating on skin, as they knock the skin’s pH out of balance. So you’re actually left with dehydrated skin that needs to be rebalanced. SLS can also be cross-contaminated with potentially toxic manufacturing impurities like 1,4-dioxane. Yep, those pesky synthetic preservatives are in conventional body wash too. They’re designed to make the formula shelf-stable for (almost) ever, and they’re more needed in liquid body washes than in bar soap because body wash often contains water or another liquid ingredient that could attract bacteria. But, methyl, propyl, ethyl and butylbarabens can mimic estrogen and can act as potential hormone (endocrine) system disruptors. Both artificial fragrances and colors are often made up of chemical compounds that don’t have to be disclosed under Trade Secret laws, meaning they can contain ingredients that are banned for use in personal care products. Synthetic colors are often made from coal tar, and some can contain heavy metal salts, including lead, which is a known human toxin. So that rainforest-scented, bright green gel we’re supposed to caress into our skin? It’s been linked to headaches, nausea and more. All this knowledge doesn’t have to be scary—when you know more, you can choose better (or at least know what you’re really getting when you stock up on conventional body wash). 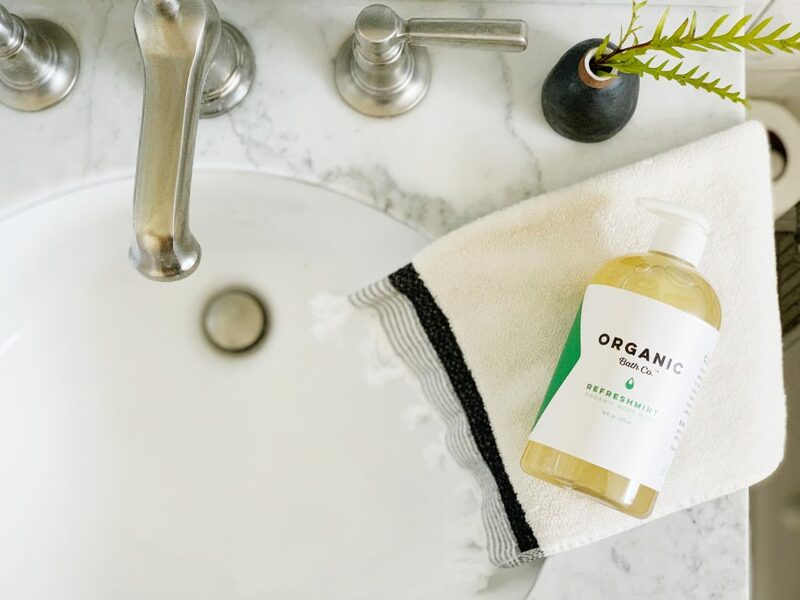 Getting clean doesn’t have to be complicated, which is why we designed our Body Washes with skin-loving ingredients like organic aloe, organic coconut oil, organic jojoba oil and organic essential oils. More on that to come, but in the meantime, read up on why we’re committed to clean, not complicated ingredients.